For sailors, the Annapolis sailboat show is the one show that we all like to attend every year. There may not be a lot of sailors in the U.S. when compared to countries like England, France, New Zealand and Australia, but we are a passionate tribe who like to get together at this annual happening. BWS has been going to the show to exhibit for the last 22 years and our staff has been at the show well before that. Every year we are amazed at how vibrant the sailing industry seems when it is all gathered together in one spot. There are some general trends worth mentioning. The number of boats in the water is down from the industry’s heydays in the late 1980s but Annapolis is still the place to go to look at all the new boats on the market. Monohull numbers are down a lot but multihulls have grown in number every year. 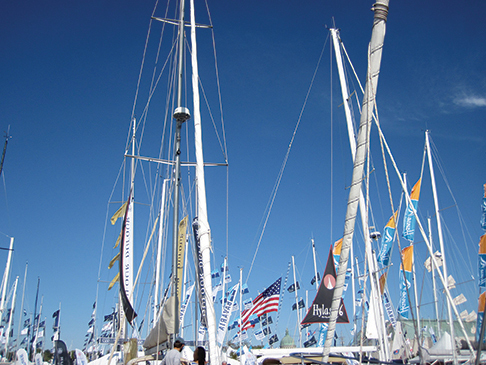 This year, the show will be the largest multihull show in the country. Also, boats are getting steadily larger. A 36-footer used to be considered a perfect size for family cruising, not too big, not too expensive, and not too hard to maintain. But nowadays, 45 to 50 feet seems to be the average among cruising boats and we’re seeing many production boats larger than 55 feet that are designed to be sailed by couples. Forty-five to 55-foot cats are now about average in the multihull fleet and offer so much space, they are equivalent to 70-foot monohulls. It is now a year since hurricanes Irma and Maria devastated the Caribbean and Florida Keys. The charter companies based in these areas were severely damaged but now almost all are getting their fleets up and running and are looking forward to a more normal winter charter season this year. It has been a tradition among boat builders to display new models for the American sailing public at the Annapolis sailboat show and this year is no exception. 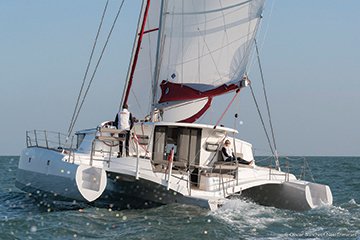 Beneteau will be showing the all new Oceanis 46.1, which is a couple’s cruiser that is bound to be a huge success. The large French builder is also launching their new sportboat line under the First banner. The boats started life as Seascape boats from Slovenia and provide Beneteau dealers with a new entry level style of fun cruiser/racers that should appeal to the younger generations. 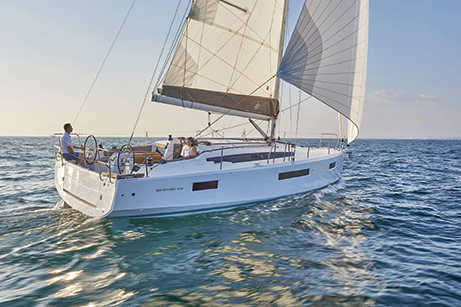 Jeanneau will have two new boats at the show, their Sun Odyssey 410 and the new pocket cruiser the Sun Odyssey 319. The SO 410 is the little sister to the new 490 and 440 that were launched last year. It falls right in the middle of the range and will make an excellent couple’s cruiser. The new SO 319 is a perfect entry level boat for a family who want a simple, fun and inexpensive way to get out on the water. Plus, the 319 will definitely appeal to older sailors who are downsizing from a larger cruising boat. Another large French builder, Dufour will have at least three boats at the show with the Grand Large 412, 460 and 512. 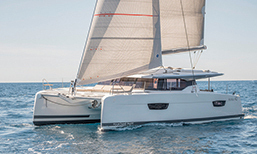 Dufour rivals Beneteau and Jeanneau in Europe but has not made the same inroads in the North American market. If you are looking at a Euro-style performance cruiser this fall, you should add Dufour to the list of boats to visit at the show. The large German builder, Hanse, always has a big display at the show and will have five or six of their performance cruising models for you to look over. 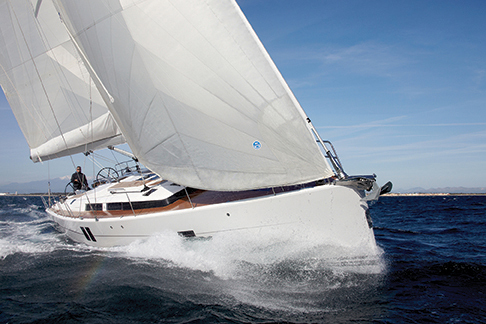 Like the other big European production builders, Hanse has a wide range for you to choose from 34 to 55 feet. Hanse has always combined modern Euro-styled hulls and rigs with interiors that evoke the old days of teak and holly. Island Packet will be displaying their all new, American built, IPY 349 that has only recently been launched. The new entry level Island Packet comes in with an attractive price and all of the traditional design and build details that have made IPY cruising boats favorites in the blue water fleet. IPY will also have a Blue Jacket 40 and a Seaward 32 to fill out their company’s brands. Another venerable American builder introducing a new model, Tartan Yachts will be displaying the new Tartan 395. This mid-range cruising boat offers a lot of the quality and attention to traditional detail that has been a Tartan hallmark for almost 60 years. Tartans are built with epoxy hulls and carbon fiber spars, so they will serve their owners for generations. Catalina Yachts, which was once the largest builder of sailboats in North America, is still going strong and will have their full line of cruising boats on display. The new 425 is the latest design in the fleet and offers an updated and thoroughly modern take on the values and quality that have made Catalina owners some of the most loyal repeat buyers in the industry. The company uses the marketing line “The closer you look, the better we get,” which is a very honest assessment of the company’s commitment to their core values about quality and integrity. Passport Yachts, based in Annapolis, always has two or three boats in the show that are usually show-stoppers. These elegant, traditional couple’s cruising boats, are loaded with fine joinery below decks that is assembled to each new owner’s specification. While the hulls and basic accommodations plans stay more or less the same, each new owner can spec out his new Passport to a very high degree of detail. If you are looking for a boat that evokes generations of traditional boat building, you should take a look at the Passports. A number of European builders of semi-custom yachts will be displaying new or relatively new monohulls, among them Amel, X-Yachts, Hallberg-Rassy, Discovery Yachts, Southerly, Gunfleet, Oyster and Swan. These high-end boats are built to order and offer their exclusive customers a level of quality you would expect from a builder who makes each boat uniquely for each customer. There are often long lines to board these boats since for most sailors such sailing craft are out of their reach. Among the multihulls you will have the widest selection of brands and models to choose from of any boat show in North America. In fact, the size of the multihull section of the show has grown to rival even the large multihull shows in Europe. The big three multihull builders will be there in grand style. Lagoon. Leopard and Fountaine Pajot all will have their full lines for you to view. 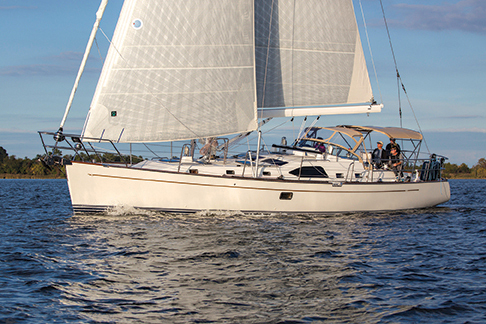 Among the new boats, Leopard will introduce their new 50 footer to the Annapolis crowd. This new design offers a huge cockpit aft, a large forward cockpit and the option of a third cockpit on top of the hard top over the aft cockpit. Lagoon will have their all new 40 and 50 foot cats that debuted at last winter’s Miami show. Both boats combine excellent family cruising design ideas with the practicalities of building boats for the world’s bareboat and crewed charter fleets. 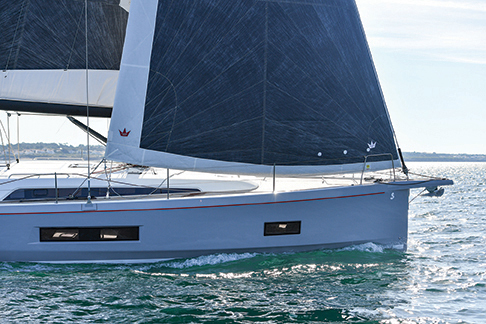 Lagoon has made a lot of innovations with these designs, including all new rigs that reduce the mainsail size for ease of handling and increase the genoas for more power that can be easily reefed from the cockpit. 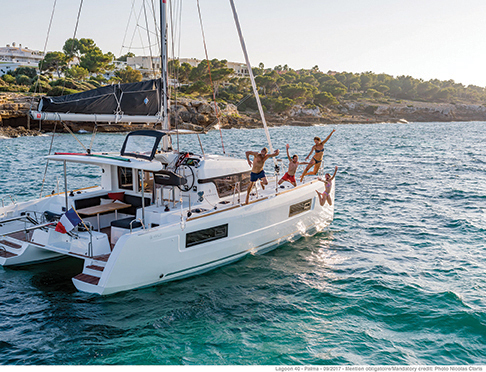 Fountaine Pajot has been growing rapidly and introduces new designs at least once a year. This year they will have their new Astrea 42 cruising cat and the all new 45 foot cat. The 42 is tailor made for a couple or cruising family who want to keep things simple, elegant and affordable. The new 45, which has a cockpit on top of the cockpit’s hard top, offers truly elegant and spacious living yet is not too large for a couple to manage the boat by themselves. Catana and Bali will be at the show with the two brands. Catana focuses on building cruising cats for couples and crew who are planning serious ocean sailing. The Bali line targets buyers who want to put their boats into the Dream Yacht Charter fleets around the world. This last year, Dream became the world’s largest charter company, in no small part because of the success of the Bali cats. Performance cruising cats is a design category that is getting a lot of attention these days. Boats in this more rarified air, are built more or less to order on a semi-custom basis and offer owners both exotic designs and materials which is combined with high end elegance. You will find at the show boats like the Balance 526, which is a fairly new brand that is being built in South Africa. In addition, you will see the new HH 55, built in exotic materials by Hudson Yachts in China, and the new Outremer 5x, which is built in France for the performance and semi-custom market. South Africa is a hot bed of catamaran builders. In addition to the Leopards and Balance cats, you will also find small builders at the show who offer interesting cruising designs that often are perfect for cruising couples. The St. Francis 50, Xquisite 50, Knysna 48, Majestic 53 and Maverick 44 are all semi-custom cruising cats that have proven to be perfect for couples who know what they want and are planning to live aboard and sail the world. From Asia, you will find the new Seawind cruising cats that are built in Vietnam. These open plan Australian designs combine great sailing qualities with indoor-outdoor living accommodations. 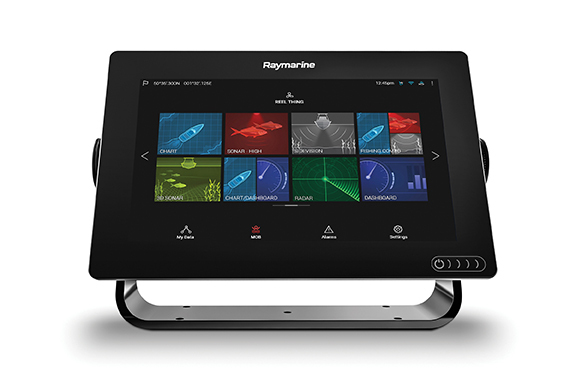 Seawind plans to have their 1160, 1160 Lite and 1260 at the show. If you are looking for a cat in the smaller and more affordable range, the Seawinds should be on your list. Other short run semi-custom cats at the show will be the Antares 441 from Argentina and the Maine Cat 38 which is built in Maine. The Antares is a dedicated blue water boat that comes from the builder ready to sail across oceans. The Maine Cat is more of a coastal cruiser that will be excellent in the Bahamas or Caribbean; built in Maine the Maine Cats are imbued with that special “Maine built” quality that has made the state such a famous home for quality boat building. Trimarans are gaining in popularity because they sail so well and in the smaller range can be trailered by a family SUV. These folding, trailerable tris include the Dragonfly designs from Denmark and the Corsair designs from Vietnam. You do sacrifice some interior volume in these tris, but for the sheer love of sailing and the ability to explore cruising grounds far and wide by trailer, they make a lot of sense. Traditionally, the big charter companies like to offer good discounts on bareboat and crewed charters during the Annapolis sailboat show because they want to get their booking books filled up for the winter charter season in the Caribbean. The Moorings, Sunsail and Dream Yacht Charter all have big tents right in the middle of the show and over the five days they will all be doing a land-office business signing up charters. This year, the fall bookings and great offers are especially important because of the devastation that hurricanes Irma and Maria inflicted on the BVI, St. Martin and Puerto Rico last year. As the rebuilding goes ahead in the islands, and it is going ahead slowly, the charter bases and fleets are all back in business and ready for you and your friends to go chartering. Plus, the big companies all have bases around the world, so if you hanker to explore Thailand or the Seychelles, you can make that happen and probably get a good deal at the show. The success of the big companies at Annapolis has spawned what the show now calls the Vacation Basin and the Mediterranean Corner. These two venues are in what locals call “Ego Alley”, which is the body of water that runs right into the middle of town. In Vacation Basin, you will find dozens of charter companies with their booths erected on large floats. You can find charter opportunities, sailing schools, time sharing packages and much more. 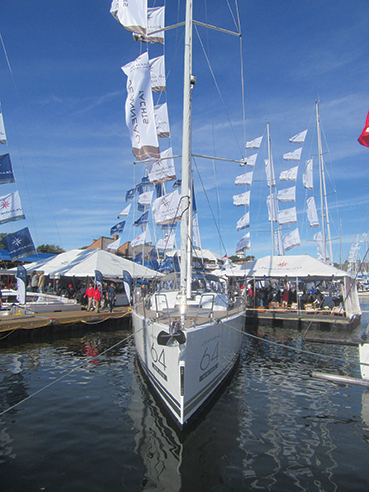 The show has made the basin a one-stop-shop of anyone looking for vacations under sail. Right next to the basin, the Mediterranean Corner is a tent filled with charter companies and vacation brokers representing charter opportunities throughout the Med. You can talk with folks from Turkey, Greece and the Ionian Sea. You can look into chartering in Croatia or Montenegro. Or you can explore Italy and the Balearic Island in the western Med. They are all in the same tent. For sailing schools, you will find them scattered around the show with J/World, Colgate’s Offshore Sailing School and the Blue Water Sailing School always well represented. 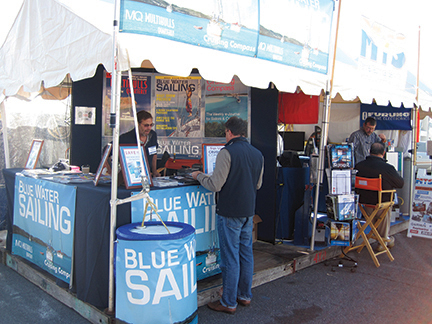 Stop by these booths to discover how you can transform a winter sailing vacation into a family skill building vacation that will help you be a better skipper and crew and make your time chartering or sailing your own boat more fun. There are so many tents and so many booths in those tents that you would need a month to visit them all. You will find vendors representing and selling everything from clothing to marine electronics, from marine engines to the latest in sails. If you have a mission to find certain products and companies, it makes sense to get a program at the gate or download the program PDF from the show’s website and do some homework. The way the show has grown and evolved over the decades, most companies with similar products are not in the same tents so you can spend hours searching for what you need. So, make a plan and then go forth and enjoy the sailing buzz. The show management has made a concerted effort over the last few years to expand the seminars and educational opportunities provided by the show. The First Sail program offers new sailors courses in the basics of sailing and sailboat ownership. If you are new to the game, this is the seminar program to start with. You’ll be amazed at how much you can learn in a short span of time. The Take the Wheel program, sponsored by Jeanneau, allows new sailors to get hands-one experience actually sailing in Annapolis harbor. You will go out with experienced instructors who will assess your skill level and help you become more proficient at making a sailboat go where you want it to while trimming sails and navigating. Paid and sponsored seminars are run throughout the show schedule and you can take day-long and half-day seminars that will introduce you to the cruising life, teach you about catamarans and cat cruising and help couples learn how to be self sufficient and capable aboard their own boats. 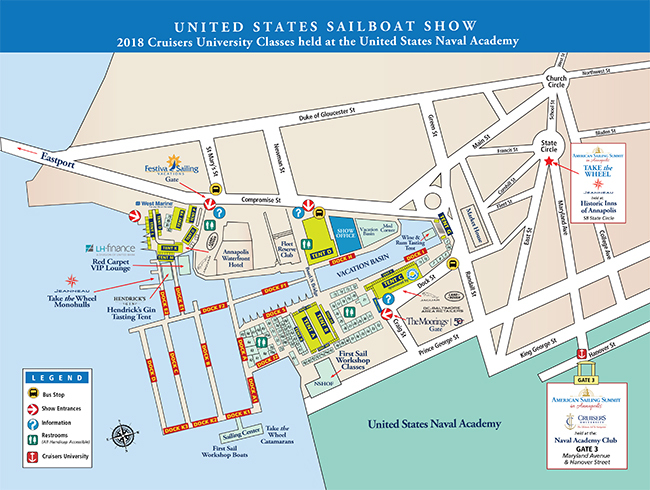 Cruiser’s University runs for four days at the tail end of the show from October 8 to 12. There are more than 40 different seminars offers and you can purchase individual courses or buy a track of courses aimed to build your specific skills. On Monday the 8th, the show closes at five pm and then the break up begins. All of the boats have to be out of their slips that evening and once the break up starts it goes very quickly in a kind of chaotic dance of boats, floating docks and work boats. It is traditional to watch this from the docks next to or the roof bar above Pusser’s Restaurant, which is right in the middle of the show. And it is customary to do so with a pain killer or two in hand. The skippers running the boats often put on a good show and there will be enough close calls and even the occasional collision to give the breakup something of a NASCAR feel. It is always a great way to end the five-day show.